Kat Von D of LA Ink is attempting to set a new Guinness World Record today by doing the most tattoos in a 24 hour period. Kat will attempt to tattoo 400 people on a first come first serve basis. She will ink only one design that is set to Guinness regulations, no less than 2.25 x 2 inches and it consists of only two colors. The tattoo Kat chose is a red and black LA logo, which will set customers back $20. The proceeds will be donated to Vitamin Angels, which “provides supplements to developing countries and communities that are in dire nutritional need.” Kat’s tattoo shop, High Voltage, is closed today to regular customers, and the World record attempt is being filmed as part of LA Ink’s second season. See more photos after the jump. 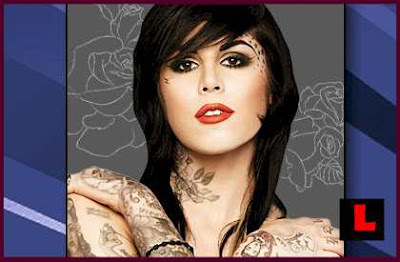 Kat Von D (born Katherine Drachenberg, March 8, 1982), is an American tattoo artist and television personality. 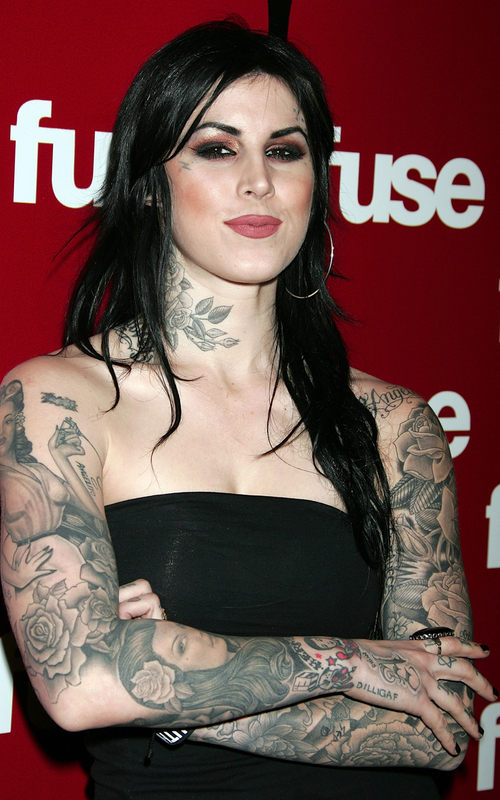 She is best known for her work as a tattoo artist on the TLC reality television show LA Ink, which premiered August 7, 2007 in the United States and November 11, 2007 in the UK. i've read the yelps, i know ya'll don't care much for her...but this is world record stuff! So, we have been talking about setting the record for the most tattoos done in a 24 hour period by one person, since the Miami Ink days, and FINALLY we are gonna do it, here, in Los Angeles, at my tattoo shop! 1. Each tattoo is to measure a minimum of 1.25 x 3 inches. 2. Each tattoo must have a minimum of 2 colors. 3. The attempt must be overseen by 2 independent persons, with experience in tattoo techniques. Only tattoos satisfying these 2 judges count towards the total. 4. The event is continuos. Rest breaks may be taken at will, but THE CLOCK DOES NOT STOP. 6. Theres is no restriction on the location of each tattoo. 7. The total should not include any tattoo not completed at the end of the time period. 8. All people getting tattooed must be 18 with ID. So with that in mind, I'm gonna be doing an "LA" tattoo logo that was approved by Guinness, on anyone who wants to be a part of this!! I'M INVITING ALL OF YOU WHO ARE DOWN TO GET THIS TATTOO, TO COME HELP ME SET THIS WORLD RECORD!